Driving on a back country road to visit a man who saves plant seeds from all over the world; someone who has resisted Monsanto and their ideas about patenting seeds so farmers must buy only from them, or be punished if they don’t, we came across this landscape. 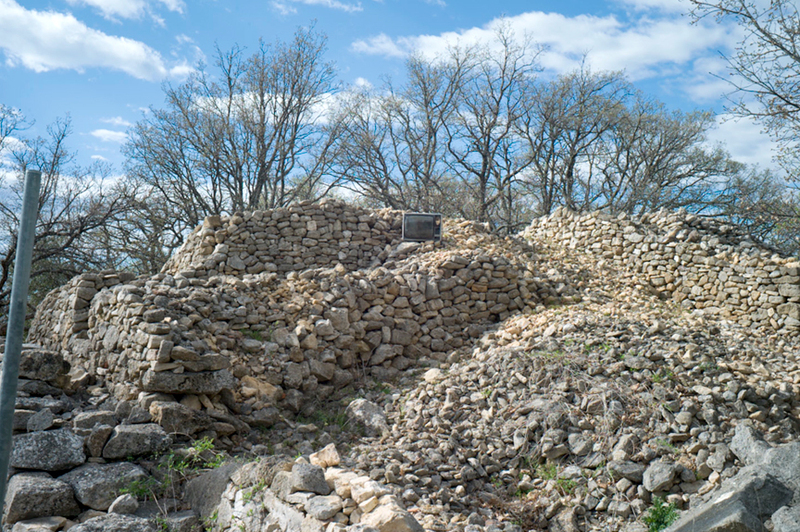 I don’t know if it is a monument to someone’s idea of the civilization we are living in, or the fallen ruin of what in this part of France are called Bories, stone dwellings built centuries ago by migrant shepherds. But whatever the reason, the apocalyptic image called out to be walked around. Of all the images I made this first one held the immediacy of the surprise, and the right scale for the TV set perched on the pile. And even though there were some strong alternates they stay behind on the contact sheet. Why is that? The old Zen saying, ‘first thought, best thought’ may be true as a photographic maxim too. Of course it doesn’t always work that way, and persistence and movement can bring wonderful new points of view and ways of saying what you want to say as you discover the unfolding possibilities. But often enough it is the joy of that instantaneous sighting that holds all the power and freshness of discovery. This entry was posted in Bories and tagged France, Landscape, Provence, Rocks, Television on April 22, 2015 by joelmeyerowitz2014.